The organizational units represent the internal structure of an organization and will help you define the working groups for your projects. Enter the Unit Name 3 as the only required detail you must provide. Next, associate the users who will belong to the unit. 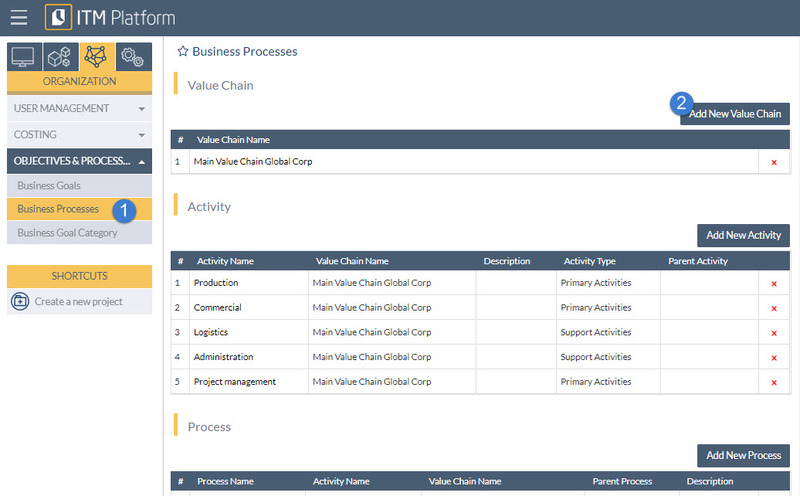 ITM Platform can reflect organizational processes with the layout Value chain > Activity > Process. This layout is not required unless the organization is structured in this way. More than one Value Chain can be defined, containing one or several Activities, and in turn for each activity the specific Processes into which the organizational structure is divided. With this structure projects can be assigned to the different processes, along with an analysis of how the activity of one department affects other processes of the organization. From the menu ORGANIZATION, in the section Business Processes 1, add the value chain 2, and in turn the corresponding activities and processes. 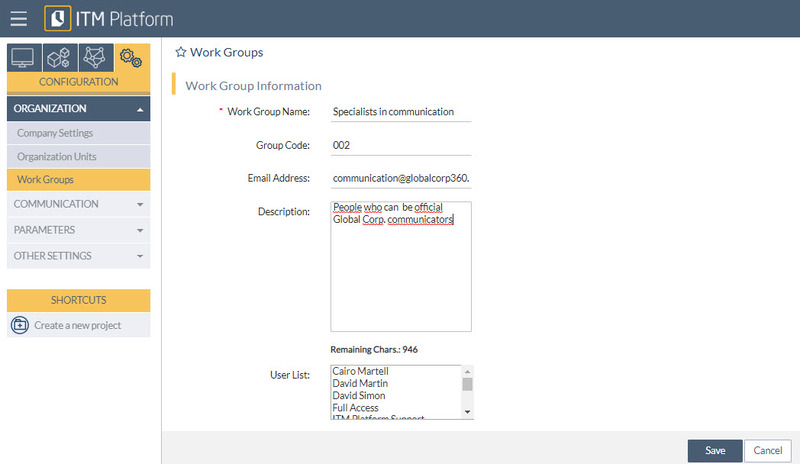 Workgroups can link users together in a way which is different from the organizational structure. For example, a group could be “Enhancement Team” or “Evaluation Committee”. The Work Group Name 2 is the only required detail you must provide. You can then add the users who will belong to the group, along with additional information to help improve administration. Users can belong to several work groups but only belong to one unit of the organizational structure.